35% are satisfied with how things are going in the U.S.
WASHINGTON, D.C. -- Americans' perceptions of the biggest problem facing the U.S. shifted a bit over the past month, with increased percentages mentioning immigration and healthcare, and fewer citing government leaders or poor government, generally. 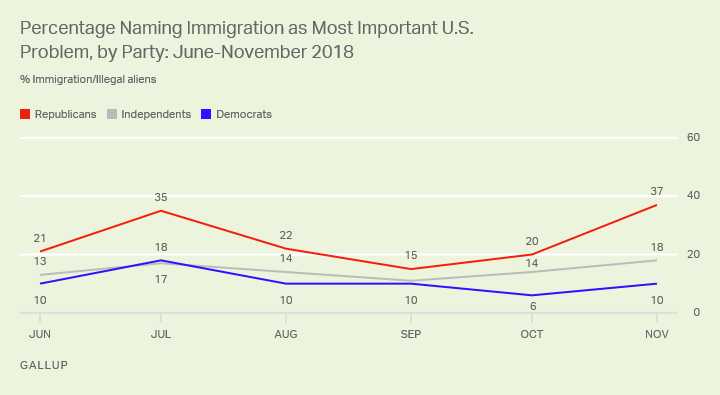 Americans are more likely to name immigration as the top problem facing the U.S. in November than they were in October -- it surged to 21% from 13%. Mentions of healthcare as the most pressing issue also increased, from 6% last month to the current 11%. Meanwhile, the proportion who name government and poor leadership decreased by nine percentage points to its current 18%, but this remains among the top problems. These data are from a Nov. 1-11 poll, which spanned the days before and after the Nov. 6 midterm elections. The current 21% who cite immigration or illegal aliens is about as high as the record 22% Gallup recorded in July. The issue's move to the top of the list comes after a large group of Central American immigrants, widely described in the media as a caravan, formed last month with intentions of crossing the U.S. border. 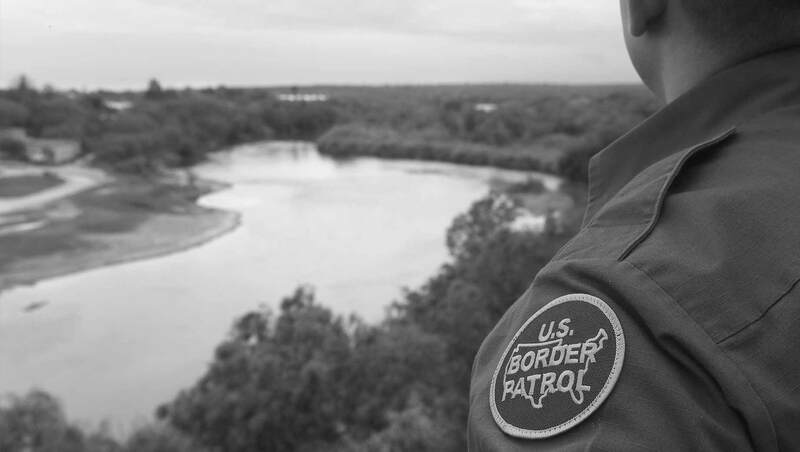 It became politicized by President Donald Trump, who declared the caravan a "national emergency" and sent 5,000 troops to the border to try to prevent illegal entries. Immigration had already ranked among the top-named issues in the months leading up to the caravan's formation, but the issue's politicization in the weeks before the midterm elections appears to have elevated it further. The issue is of particular concern to Republicans, 37% of whom name it as the most important problem -- an increase of 17 points from the prior month. This well exceeds the 18% of independents and 10% of Democrats citing immigration as the top issue. Another major issue in the midterms, healthcare, also gained prominence in November, with mentions rising to 11% -- up from 6% in October. There were small increases in mentions of this problem among all party groups, with 8% of Republicans saying healthcare is the biggest problem, along with 12% of both Democrats and independents. Meanwhile, nearly one in five Americans (18%), down from 27% in October, cite some aspect of government or poor leadership as the top issue -- keeping this near the top of the list of named problems, as it has been for almost a decade. This decrease occurred among all party groups, especially Republicans -- 14% of whom name dissatisfaction with government and leadership, compared with 16% of independents and 22% of Democrats. Currently, 35% of Americans are satisfied with the way things are going in the U.S. -- consistent with the 33% to 38% range for this issue since May. Twin 38% readings, recorded in June and October, marked a 12-year high for the measure. The latest poll shows the typical polarization among partisans, with satisfaction among Republicans (63%) much greater than that of independents (37%) and especially Democrats (8%). The average level of satisfaction with the country's direction for 2018 so far is 34%, an improvement from the average of 27% for 2017. Depending on what the incoming Congress prioritizes after being sworn in on Jan. 3, issues like healthcare -- on which the soon-to-be House Democratic majority heavily campaigned and is likely to act first -- could remain at the top of Americans' minds in terms of the most pressing issues facing the country. It's possible that immigration could retreat from the top of the list, as the caravan of migrants' journey becomes arguably more difficult now that it has reached Tijuana, Mexico, and is receiving less news coverage in the U.S. But the issue will likely remain an important one for many -- particularly Republicans -- as Trump's pledges on the issue, including a border wall, remain unfulfilled. Next month's reading on Americans' satisfaction with the direction of the country could be more revealing of what the public's mood will be in 2019, as the current figure is based on responses that were given both before and after the midterm elections. Though the federal government itself remains a commonly named problem, satisfaction with the country's general direction is relatively high compared with where it was in the recent past. President Donald Trump has a 53% approval rating on his handling of the economy, about the same as in August. His ratings for handling foreign affairs, immigration and healthcare are significantly lower.